We at Strickland Construction will help you to properly manage your septic system. We have the knowledge and experience to keep your entire septic system operating and to improve your system to assure ease of operation. Your septic system is called upon to receive and treat everything that goes down the drain. Organic wastes float toward the surface (scum layer), and are attacked by anaerobic bacteria. Up to 50% of the organic wastes decompose and the byproducts settle into the sludge layer for later disposal. Inorganic materials such as soil, settle directly to the sludge layer. 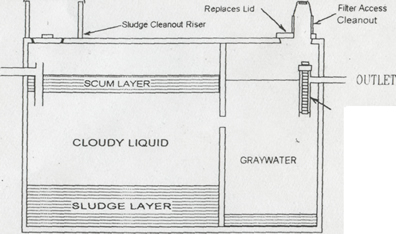 As the sludge layer builds, it reduces the effective volume of the tank. When the sludge layer and the scum layer take up about 50% of the tank, the retention time is reduced to a point where solids do not have time to be treated. This results in solids going directly to the leach field. The pumping frequency chart to the right shows an average time when this volume is reached. Your water usage determines the amount of time the bacteria can act on any solids that enter the tank; therefore, anything you can do to reduce or level out your water usage, will improve the performance of your tank. The bacteria in your tank are continuously supplemented by normal household effluent; however, they are extremely sensitive to changes in their environment. The use of chlorine additives in your toilet tank could kill your septic bacteria colony. Also, avoid excessive use of caustic drain cleaners. Do not pour herbicides, petrolium products, paints, or other chemicals into your system. Avoid dumping cooking oils or grease down the drain and keep garbage disposal use to a minimum. The use of bacterial or enzyme additives is not recommended and could damage your system. Periodic pumpouts are necessary for the proper maintenance of your septic system. If solids are not removed periodically, they will flow to the leach field and cause it to fail. If your tank lids are buried, risers can be constructed to facilitate checking and pumping. Also, an effluent filter can be added to prevent solids from entering your leach field. The diagram at left shows how your system can be improved to assure a long service life.